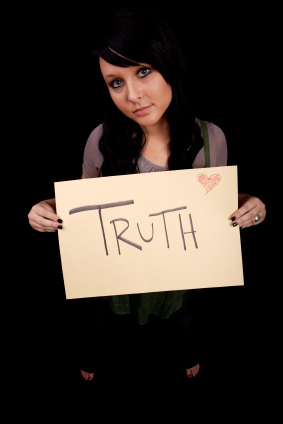 Article: Do You Have Truth-Tellers in Your Life? Leslie Answers Your Questions: Husband says he's sorry and will change, but doesn't. Now what? This past week, I spent time with some amazing women at the annual retreat we take together. This is our fourth year, and each time gets better and better. We share our lives, our successes, our struggles, our fears and our failures, both personally and professionally. We pray together, sing together, study God's word together and cry together--so much so that on the last day we had to ration our tissues and keep them well beyond their usefulness because we were running out. We give each other clothing tips, make-up tips, ways to organize our lives (we're all busy speakers and writers) and most precious of all, we encourage one another by telling each other the truth. One year, Jill gently told me that most of the clothes I wore were not flattering to my shape. (Ouch!) Georgia reminds me that I'm too busy and I need to slow down. Wendy encouraged me that I was a good writer (when I doubted myself). Kendra told me I was a kindred spirit friend. I absorb their words like delicious food; they fill me, nourish me, and help me stay the course. These dear women also ask me hard questions about my life, my priorities, my longings, my relationships, my habits, and what specific things God is telling me to do and to change. The writer of Hebrews says, "Take care, brothers (and sisters), lest there be in any of you an evil, unbelieving heart, leading you to fall away from the living God. But exhort one another every day, as long as it is called 'today,' that none of you may be hardened by the deceitfulness of sin" (Hebrews 3:12,13 ESV). These warnings apply to all of us. No matter how long you've been a Christian, how many times you've read through your Bible, what position you hold, or accomplishments you've attained, you can still develop an evil and unbelieving heart and be hardened by the deceitfulness of sin. We've seen it happen among the best Christian leaders. Don't fool yourself into thinking that you're above falling down hard or slowly drifting away from the truth. So friends, here are four hard questions that I want to ask you so that you may not drift, fall down, or become hardened by sin's deceit. Do you have people in your life who will tell you the truth; that will warn you and encourage you? If so, who are they? When they have spoken truth to you, do you receive it and profit from it or do you resist it and refuse to listen? Do you share honestly and openly where you are at so that if you are falling away from truth or becoming hardened by the lies of Satan, someone would know before your outward life crashes? Finally, if you answered no to any of the first three questions, what is your action plan to invite truth tellers into your life and heart so that you can become all that God has for you? My prayer for you is that you would not miss God's best by believing Satan's lies. That's what happened to Adam and Eve. Jesus too was tempted with Satan's lies in his desert experience, but he didn't fall for them. All alone we aren't capable of recognizing lies because our very nature prefers lies before truth (Romans 1:25) and the roots of unbelief are not easily eradicated even when we have great faith (Mark 9:24). Friends, we need God but we also need one another. Far too many people think that they have to suffer in order to live a God-ly life. They find themselves wallowing in negative feelings, dealing with feelings of overwhelm and experiencing intense sadness. I'm sharing the keys to living a happy, joyous and fulfilled life according to God's plan in a special free webinar on Wednesday, February 1st at 9pm ET. Husband says he's sorry and will change, but doesn't. Now what? Question. My husband has had two affairs, he throws things when he's angry, abandons me for days at a time after an argument, and now has just completely detached himself from our family. He also lies about his whereabouts. I want to be the wife God has called me to be, but I can't continue this way. My husband always says he is sorry and will change, but these behaviors continue to resurface. Please help. Answer. I think the first question you must settle is what kind of wife do you think God wants you to be for your husband? Is it a wife that allows herself to be abused, abandoned, lied to, and cheated on with no consequences? You say I can't continue this way. I don't blame you. No one would want to be married this way. But I think your dilemma is that although you can, with God's help, be the wife that God wants you to be, that doesn't guarantee that your husband will become the husband God wants him to be or that you want him to be. But the question remains, what kind of wife do you think God wants you to be here? Do you think he wants you to be passive and continue to live with a man who lies to you, cheats on you, leaves you, and scares you when he's angry? Or, might God be calling you to love your husband in such a courageous way that you boldly confront his sinfulness, refuse to accept his excuses, and, if he wants to remain married to you, require him to show through his behaviors that he's repentant and truly wants to change. His words are meaningless. He lies. If he wants to be married, it's time that he takes specific and consistent action steps that demonstrate that he's serious and willing to work hard to change. What might that look like? For starters, he needs to get some accountability partners that will help him stay honest, engaged, and sexually faithful. He needs a plan to help him learn how to manage his emotions when he's angry or hurt so that he doesn't get destructive, deceitful, or disengage for long periods of time. Obviously he hasn't been able to change these habit patterns by himself, so he will need to get professional or pastoral help to learn how to deal with his emotions and understand why he does the things he does. These changes do not happen quickly or painlessly but, with God's help, are possible for the person who is committed and teachable. I think you fear that if you hold your husband to these necessary changes and he refuses, then what? I'm going to tell you the unvarnished truth. Your relationship is broken. You may stay legally married, you may even still live together, but you cannot have a good marriage if your husband will not change. Hear me. You can make a bad marriage better all by yourself (by not retaliating or repaying evil for evil), but you cannot make a bad marriage a good marriage all by yourself no matter how good a wife you are. We only have to read through the book of Jeremiah to see how God longed for Israel to repent, to come to her senses and change, but she would not. God loved Israel, but He could not and would not have a close and intimate relationship with her until she was willing to change her sinful, adulterous, deceitful ways. God knows what you're going through. Let him empower you to be the wife he wants you to be and the wife your husband most desperately needs. You don't have to live this way.